More than a book . 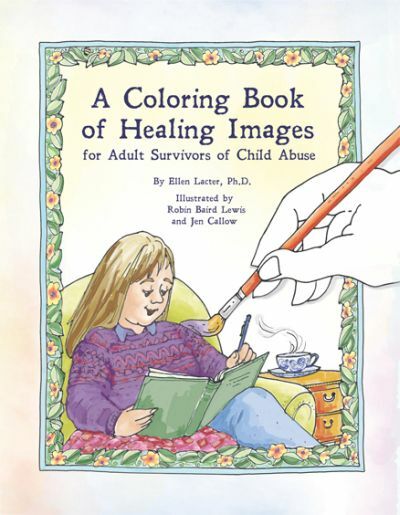 . .
A Coloring Book of Healing Images for Adult Survivors of Child Abuse was lovingly conceived to bring healing to anyone who was abused as a child. In poetic prose, lots of helpful tools, and over 100 illustrations on heavy stock paper, the author-psychologist has captured the best of three decades of clinical experience about “what works” to heal. As the reader applies art media to the images, their meaning can be deeply internalized to tap into the survivor’s infinite internal resources and to pave a personal path for healing. The images in this coloring book have been lovingly conceived and developed by the author and illustrators to bring healing to anyone who was abused as a child. The author has been observing, learning, and collecting “what works” for over 30 years. Each chapter begins with a page or two describing an aspect of healing. Next, most chapters include a list of ideas to facilitate that aspect of healing. This is followed by suggestions for creative expression. Then the coloring images are listed, each with a self-affirming intention. The next pages are a series of full-size healing images on heavy weight paper suitable for most art media. It is the hope of the author and illustrators that as the reader-artist colors these images and lingers on their meaning, all that they hold of value will be slowly digested and integrated into mind, body, and soul. Within each child abuse survivor are resources of intelligence, creativity, sensitivity, and wisdom which not only survived the abuse, but also likely developed in extraordinary ways because of the abuse. Our hope is that these messages and images will tap into these inner resources and help them realize their full potential. “Professionals of all theoretical backgrounds find themselves searching for practical resources to offer adults who were abused in childhood, whether to use within clinical time or to offer as a therapeutic activity in the long lonely hours. This coloring book is a much-needed and distinctive new contribution to the field. Ellen Lacter has been an art therapist since 1977, clinical psychologist since 1986, and Registered Play Therapist-Supervisor since 1998. She specializes in the treatment of abused children and adult survivors. She has a sub-specialty of working with survivors of ritual abuse and mind control and is an activist on behalf of these victims. She has published a number of scholarly articles and chapters on ritual abuse and mind control and maintains a website (http://www.endritualabuse.org/) to educate the public and mental health community on these subjects. She is also Academic Program Coordinator for the Play Therapy Certificate Program at University of California San Diego-Extension. Robin Baird Lewis, a professional illustrator since 1979, has over two dozen titles in a variety of genres, from children’s fiction to architectural preservation (see: robinbairdlewis.com). Her 1982 Canadian Classic, Red is Best, reached its 25th anniversary. Her most recent title is James G. McGorman’s The Ale Sea. Robin staunchly supports the Illustrator’s Code: To Serve the Text, and enjoys developing a close and intuitive collaborative relationship with authors. She feels immense satisfaction in having collaborated so closely with Ellen Lacter in developing this book for those so worthy of personal love and support. Jen Callow has been drawing since she was old enough to hold a crayon. In addition to being an artist, she is multiple (dissociative) and a survivor of ritual abuse. For many years, her creative outlets played a key role in her healing. In recent years, her art has become increasingly for pleasure and self expression, and for the sheer love of creation. She feels both proud and blessed that through her art she can now help others on their healing journeys. She is honored to have been a part of this coloring book project.